I SUPPOSE what I’m trying to capture here is – what was the quintessential style and substance of the ministry of John Gerry, the parish priest, and John Gerry, the auxiliary bishop? Today, John, we honour 65 years of service as priest, and 40 years as bishop. If you lived in the mushrooming working class in the mushrooming working-class suburb of Stafford in the 1960s what would you be experiencing? The first thing you’d have experienced was a pastor ahead of his time. These are days well before Pope John XXIII announced the Second Vatican Council, but there was an operational parish council already there. The Second Vatican Council’s Constitution on the Church, was already alive and being lived, by the Queen of Apostles parishioners, under John Gerry’s leadership. Let’s take a look at John’s formation years for priesthood. He was one of 18 candidates selected by the Australian bishops to sail to Italy in 1946, and to do his priesthood studies at the Propaganda Fidei College in Rome. Some of his contemporaries on that ship who he’d study with included names you know like Tom Sweeney, John Mullins, Tom Lambert, Frank Little, John Moloney and Noel Tobin. When Archbishop Panico opened Banyo he insisted one student from each diocese in Queensland was to go to the Propaganda Fidei College in Rome. But I know it wasn’t Propaganda Fidei alone that shaped John’s formation for priesthood. There was also the influence of more senior students, and some faculty staff who were in touch with the post-Second World War movers and shakers in the new movements like the new liturgical movement, the new emerging theologies, the new lay movements like the Grail and Cardijn-inspired Young Christian Workers. The older Propaganda Fidei students who led John down these paths, names like Gillie Young, Francis Rush, Grove Johnson, Con Keogh, were no longer over there. They’d come home because of the war. But they left behind a wonderful library and precious resources. John’s first parish, as associate pastor, was Coolangatta, in 1951. Five years later he transferred as assistant to the cathedral under Fr John Torpie, the administrator. In 1961 he was sent to Stafford parish to help the ageing Fr Mick Carew who was in poor health. He subsequently became Stafford’s second parish priest, in 1962, age 35. By rights, we ought not to be celebrating John’s ordination to priesthood until next year. But the Aussie contingent at Prop was forever trying to break the bounds. What if they could persuade Pope Pius XII to let them be ordained a year earlier, in 1950, under the pretext that it was the Holy Year, rather than in 1951? Pope Pius XII put a small obstacle in their course. They had to be 24 years of age before ordination. The rector of the seminary, Felice Cenci, deftly moved the traditional date for some Prop ordinations back from the feast of Easter week to a date in December 21. By that date in December, eight of the 10 Australians could jump through the hoop, including John. So, John, we’re obliged to conduct your first tribute one year earlier. When I arrived to do my pastoral diaconate in Stafford in 1968 I found I was way out of my pastoral depth. Queen of Apostles was nothing like our pastoral studies director, Cyril Shand, could possibly have prepared us for. There was the pastoral council, the liturgy committee, the credit union, the Stafford saints youth group, the ecumenical group, the charismatic prayer group, the mothers’ guild, at least 20 ministries. Each guild was named for a petition in the litany of Loreto. I found myself back in Stafford as associate pastor in 1973. John was a tireless and sensitive pastor and he had a highly effective administrative style that I have since defined as “interactive flat management”. John would almost never say no to anybody. If it couldn’t be yes he’d have a response like, “let me think about that” or “I’ll take that idea up with the pastoral council”, or the riskiest response of them all, “I’d like to run that by Joe Duffy”. Another way he had of saying no was actually by saying nothing, blinking, and smiling like a well-fed Cheshire cat. Put simply – a pastor with deep faith, sharply focused insights, always available for people, forward thinking, reading, praying and studying. John, I always regarded it as a privilege and a plus to be appointed to the Stafford parish and to work under your inspired leadership. Even if not for long. Because the following year Archbishop Francis Rush called John to get ready to become the archdiocese’s first vicar for social welfare. John moved from Stafford to Herston. And so began the Golden Age of a more co-ordinated approach by Brisbane archdiocese to social welfare and care – co-ordinating relationships with relevant government agencies. 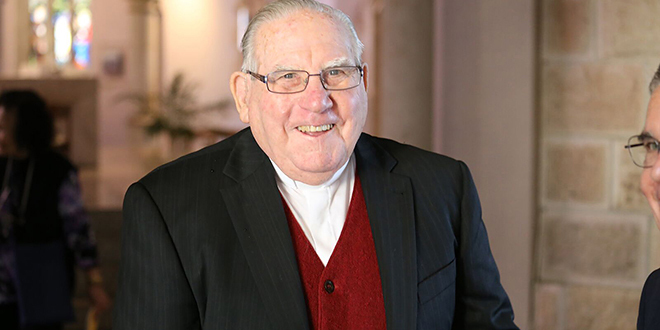 It began as Catholic Social Welfare, the birth of Centacare and the archdiocese of Brisbane becoming pre-eminent in leading the way to co-ordinated pastoral care among all the Catholic dioceses in Australia. In 1975, Archbishop Francis Rush ordained John Gerry and he became auxiliary bishop. His co-worker auxiliary bishop was the legendary James Cuskelly, Michael Putney and Brian Finnigan. John was the first Brisbane priest from Banyo to be ordained a bishop and to be bishop in the Brisbane archdiocese. John was a popular choice for bishop. His choice of motto was “Though many, one in Christ”. And he elected to have his motto inscribed in English. Since retirement in 2003, John lived at Red Hill until six years ago when he went to the Holy Spirit Retirement Centre at Aspley. He still enjoys receiving visitors, a good wine, eating out with friends, relaxing and exercising in the pool. I believe I can truly say that his ministry in the Brisbane archdiocese has been the instrument of many blessings. Fr Joseph Duffy is the parish priest of Maroochydore.